North Yorkshire is England’s largest county and one of the most rural comprising of the Yorkshire Dales, North York Moors, Vale of York and the coastal regions and they all have their own distinctive natural beauty. The county covers an area of 3,341 square miles and 40% of this area is covered by National Parks and with stunning moorland, beautiful dramatic to rolling hills, ancient woodland, a spectacular coastline, splendid waterfalls, many attractive villages and hamlets and many historic sites such as abbeys, castles, priories, stately homes and traditional pubs there is something for everyone of all ages to explore. The North York Moors has one of the largest expanses of heather moorland and it became a National Park in 1952 and covers an area of 554 square miles stretching from the Derwent Valley to the Cleveland Hills just south of the Tees. The sandstone and limestone hills have formed a rugged landscape with wide heather clad moorlands on the open tops and pretty farming communities and villages in the many sheltered valleys many of them hidden away. To the north and west the moors are defined by the steep scarp slopes of the Cleveland Hills on the edge of the Tees lowlands to the east the moors are clearly defined by the impressive cliffs of the North Sea coast and to the south by the broken line of the Tabular Hills and the Vale of Pickering. Please note the Moorsbus Network, set up in the 1980’s, operating on Sundays and Bank Holiday Mondays from 1st April to 28th October, a great way of exploring the North York Moors instead of using your car, has been refused funding from NPA and it is not yet known whether the service will continue in 2014 or in the future. Danby is a small village in the Scarborough district of North Yorkshire and also within the North York Moors National Park. Situated at the head of the Esk Valley the village is only about twelve miles from Whitby on the east coast and is served by the railway between Middlesbrough and Whitby and also by the Arriva bus service. Danby houses an inn called the Duke of Wellington, St Hilda’s Church, a village hall, the Stonehouse Bakery and tea shop, a shop, post office and a village green where sheep often graze. Danby is home to The Moors National Park Centre and with the Esk Valley Walk passing through its centre it is popular with tourists and walkers. Being an ideal place to explore the North York Moors and the eastern coastal resorts there is plenty of holiday accommodation to choose from including the attractive ivy clad 18th century inn. Danby also holds an annual Agricultural Show in August with traditional country entertainments and activities such as show jumping, sheepdog trials, exhibitions of farm animals and machinery as well as horticultural, craft and produce competitions. The Moors National Park Centre, a former shooting lodge dating back to the 17th century, stands in 13 acres of grounds on the banks of the River Esk. The centre offers ample parking, exhibits natural and local history of the moors, a lecture theatre, exhibitions, information centre, school studies, a gift shop, a book and map shop, a tea room. Outside in the grounds there’s a children’s play area, picnic area, gardens and many walks leading from here marked with yellow arrows. Danby Beacon situated on Beacon Hill dates back to the 1600’s when the country was under the threat of invasion from France. It is one of many up to 20 miles apart and it was the duty of the soldier stationed there to light the beacon at the first sight of the expected French fleet. In the 1930’s the site became home to one of the first radar stations guarding the north-east coast during the Second World War and continued to function until the 1960’s. Over the years the then wooden beacon aged so much that it disintegrated and fell down. 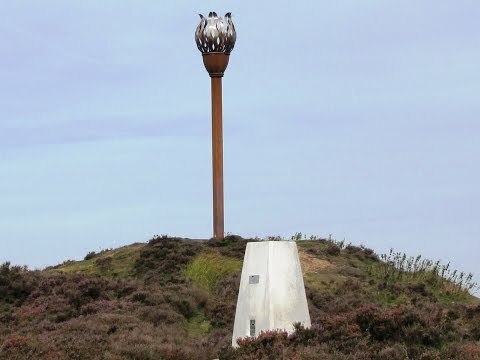 In 2008 a new beacon was unveiled by Lord Downe, President of the Danby Beacon Trust, and more than 200 people braved the October weather to see him light the beacon. The ceremony was timed to take place in celebration of Nelson’s victory at the Battle of Trafalgar. Danby Beacon is now a national landmark and stands over 5 meters high proudly representing the history and heritage of the parish of Danby. The flamed-shaped basket is made out of blued stainless steel to blend in with the sky and the flames are mounted around a cup that is decorated with bronze a reminder of the Bronze Age burial mound which occupies part of the site. Over time, the beacon will develop a patina reflecting the colours of the moorland. The views from the beacon are breathtaking you can see right out to the North Sea, the moors towards Scaling Dam reservoir and the beautiful moorland surrounding the Esk Valley. The fortified Danby Castle, built in the 14th century, has a dominating position on the far slopes of Danby Rigg. The castle once owned by the family of Catherine Parr the 6th wife of Henry VIII is now a working farm and part of the building is a farmhouse. Over 800 cairns, the remains of a stone circle, defensive ditches and enclosures dating from the Bronze Age some 3000 years ago can be found on Danby Rigg. Situated below the castle lies Duck Bridge which is a narrow medieval bridge built in the 13th century by George Duck, a wealthy mason, to enable packhorses to cross the River Esk. Houlsyke is a small attractive hamlet 2 miles east of Danby and Ainthorpe is another attractive hamlet ¼ of a mile south of Danby famous for its 15th century hotel the Fox & Hounds Inn, both have wonderful views of the North York Moors. The River Esk flows for 28 miles through the valley of Eskdale from its source at the Esklets near Westerdale into the North Sea at Whitby. It is the only major river in Yorkshire to drain directly into the North Sea. Due to the rivers rural nature it is clean and healthy which attracts an abundance of wildlife. Salmon spawn right up through Eskdale and a number of leaps are provided to enable them to travel through weirs on the course. The River Esk around Whitby has a large population of Sea Trout and is noted for freshwater pearl muscles. The small villages along the river were once of great industrial importance to the north-east with coal mined in the valleys and iron ore dug from quarries on the surrounding moors. It is only the deserted mine shafts that remain today and a footpath leads up to the moor where the old coal pits were in operation for 140 years from 1748. The Esk Valley Walk is a 35 mile long distance footpath waymarked with the symbol of a leaping salmon with yellow arrows indicating footpaths and blue arrows for bridleways. The route starting at Castleton follows a loop of the North York Moors to Danby Dale, Rosedale Head and Blakey Ridge. It then passes through the remains of Esklets, a medieval sheep farm, and on to Westerdale and, passing Castleton again, Eskdale. The route then passes through Danby and by the Moors National Park Centre then climbs to Danby Beacon. From here it carries on to Leaholm, Glaisdale, Egton Bridge and Grosmont, the terminus of the North Yorkshire Moors Railway, then continues through Ruswarp to finish at the old port of Whitby. We park at the side of the road near the village green then make our way to the Duke of Wellington and turn right heading along the road uphill to the Moors National Park Centre. The road bends off to the right but we head straight forwards following the signpost for Danby Beacon 1½. After crossing a cattle grid we ignore the small road going off to the left and head forwards for a short way and take the next small road off to the left going uphill. At the t-junction we turn right and head forwards along the small road to Danby Beacon. With your back to the beacon head forwards on the rutted track going slightly downhill. At the road, cross straight over and go through the gate. Keep following the gated track downhill to a t-junction at Houlsyke. We turn right and follow the small road past the post box and over the railway bridge to a t-junction. We turn left signposted Fryup and head forwards. Immediately after the river bridge we turn right at the footpath sign and go over a stile just below into a field. We then head slightly left uphill to a gate in the corner of the field. We go through the gate and head forwards across three fields to a farm track with Crag Farm on the left. We now turn right down the farm track crossing over the river bridge to the small road. We turn left and follow the road, ignoring a turn off to the right, until the road bends right. We head forwards to Duck Bridge cross over and turn right. Danby Castle can be seen on the hill to the left. We now follow the small road passing Kadelands House until we come to the left hand bend at Ainthorpe. We take the footpath on the right between two stone pillars going through the trees to the main road and Danby. We turn right and follow the road crossing over the river bridge and the railway bridge then make our back to Danby village green. This is an easy to moderate walk on quiet small roads and fields. There is one rutted track between Beacon Hill and Houlsyke. Approx 6 miles allow 2½ hours using OS Explorer Map OL27 North York Moors Eastern Area. Start point: the main street in Danby. Danby in the North York Moors, North Yorkshire. From the A19 take the A172 to Stokesley. Bypass Stokesley town centre then at the roundabout turn right onto the A173 signposted Great Ayton. Take the first right (y-junction) and follow the signs on the country roads for Easby, Kildale, Castleton and Danby. Or at stay on the A173 through Great Ayton, to the A171, then turn right at the roundabout for Guisborough. Then stay on the A171 for approx 8 miles and take a right turn onto a small road for Danby approx 2 miles. Parking: free road side parking only. There are public toilets in Danby and also at the Moors National Park Centre. For refreshments there is an inn the Duke of Wellington, a health shop and the Stonehouse Bakery and tea shop. There is also a tea room at the Moors National Park Centre and a hotel the Fox and Hounds Inn at Ainthorpe.